We took these beach sunset photos while listening to the Southampton bagpiper. Every Friday evening in Southampton, at the end of High Street below the "big flag" you can listen to a local bagpiper pipe down the sun. It is an activity that draws quite a crowd during the summer months. 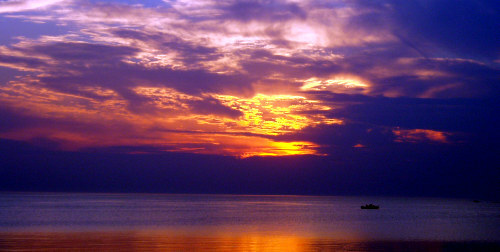 The sunsets in Southampton are constantly rated the best in Ontario. The sunset scenery is particularly excellent by the flag as you can watch the sun set with Chantry Island in the background. 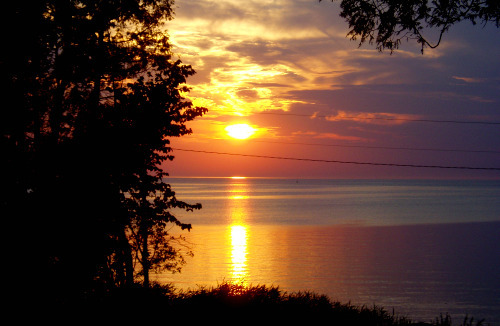 Meeting up with your cottage friends to listen to the songs of the piper and watch the firey sunsets can be a family affair. Grab an ice cream uptown at the Mid Summer Cafe or the variety store, wander down to the beach and enjoy this distinctly Southampton evening. 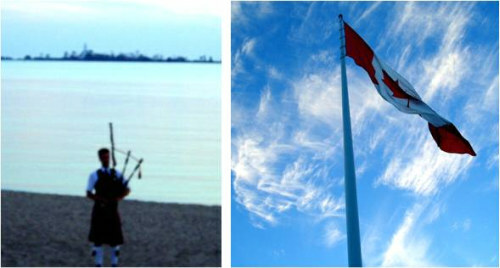 If you aren't keen on bag pipes but still want to enjoy a sunset on a beach take a walk down the Lake Huron shore along the beach sidewalk and sit on one of the benches that line the beach. Return HOME from Beach Sunset Photos.